Living off-grid require some changes to how you do things. I’ve found it’s been a few small changes that have made the biggest difference in our power consumption. For example, the vacuum was a big power draw. In fact I just stopped using it. We have tile floors, so they are relatively easy to clean, but I found a broom required more time than I wanted to spend cleaning floors. 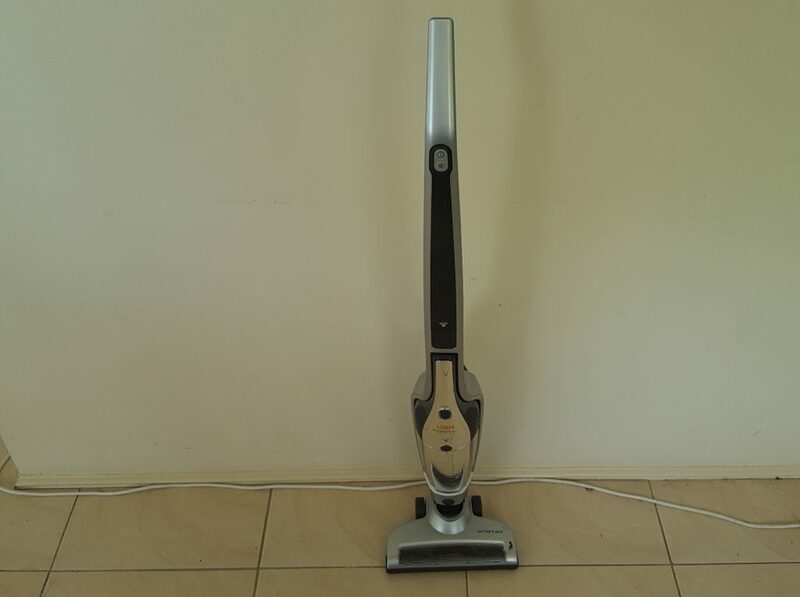 Simple solution and one of “my favorite things” is my rechargeable stick vacuum. We’ve had it for over a month, I vacuum twice a week and we have only had to charge it once in that time. It’s lightweight and picks up all the dead bugs around the living room lamp, and cleans the rug better than a broom. I’ve also found that I bake more now. Maybe it’s because I have more time, or maybe it’s because I can’t just go to the store to satisfy my cravings. You have to be prepared food wise. We are not storing food as such, but we have a backup of everything we use regularly in the pantry and only need to shop once or twice a week for fresh food. We do a “big” shop once a month. When I get those cravings, I’ve found some things in the kitchen that help me create tasty treats that don’t use power. 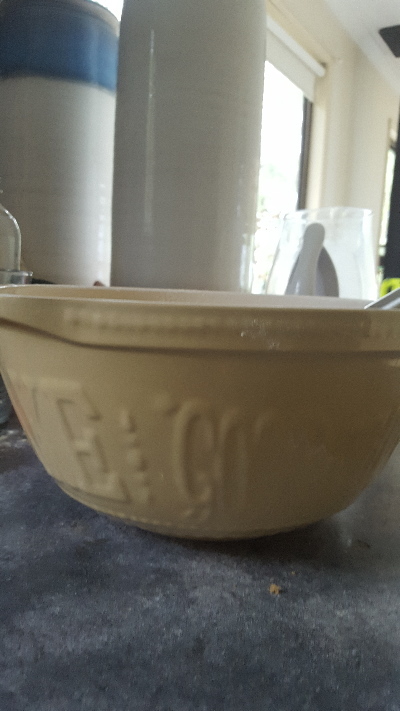 One of “my favorite things” is my large mixing bowl. I can mix everything by hand using the large capacity bowl. 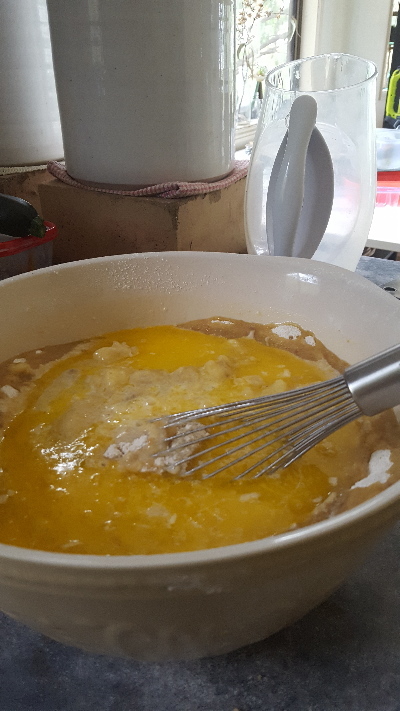 With just a whisk I can make cake batter or a batch of muffins or knead pizza dough or bread by hand without much mess or hard work. But, I have to admit that my most favorite thing of all is my gathering basket. 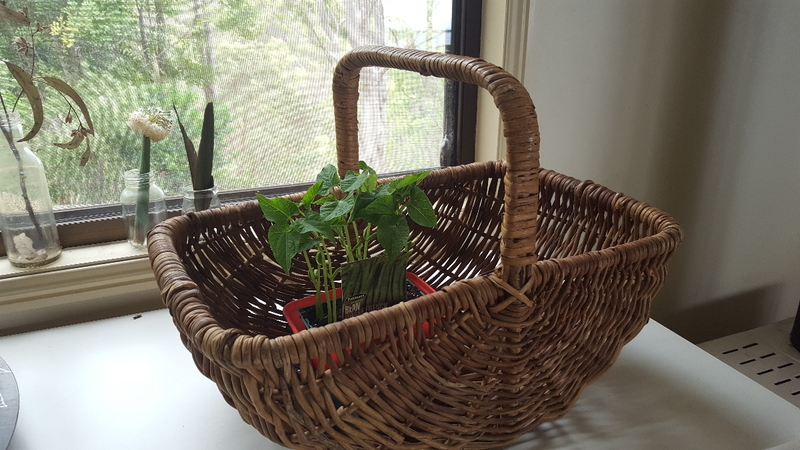 I have always had a dream of walking around my own veggie gardens with a rustic basket gathering food. 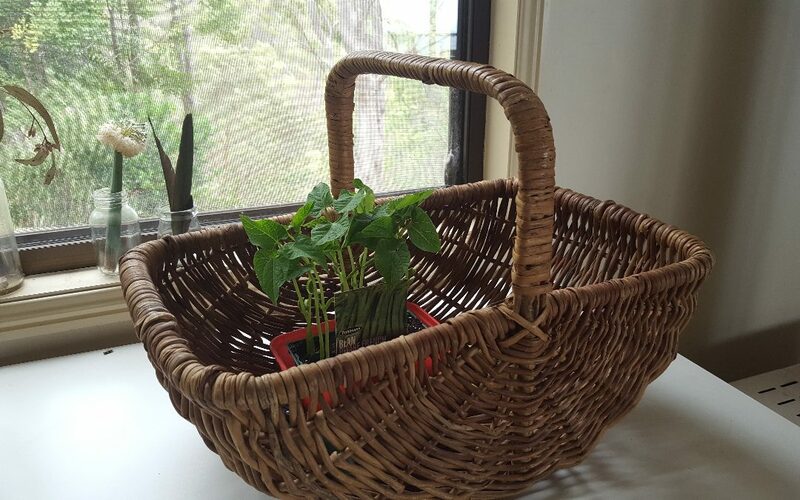 I found the perfect shaped basket at the local op-shop recently. It was a lucky find for just $3. I keep everything I need to gather veggies in it, like secateurs for cutting, garden gloves, a trowel for digging and string if something needs supporting. It’s also very handy for storing things that need to go down to the garden bed. I keep it by the door ready for gathering each day. My next favorite thing is my salad spinner. It’s perfect for washing fresh veggies after gathering. Salad spinners were all the rage back in the 90’s. I think they lost their usefulness once washed salad was introduced to grocery stores. I again found mine in the local thrift store. 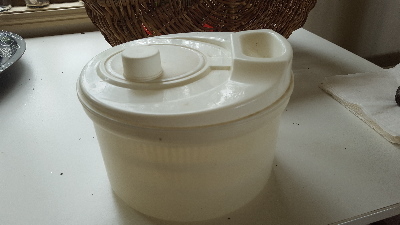 Keep your eye out for them, I believe the humble salad spinner to be essential if you are growing your own food. I have two that I use all the time! 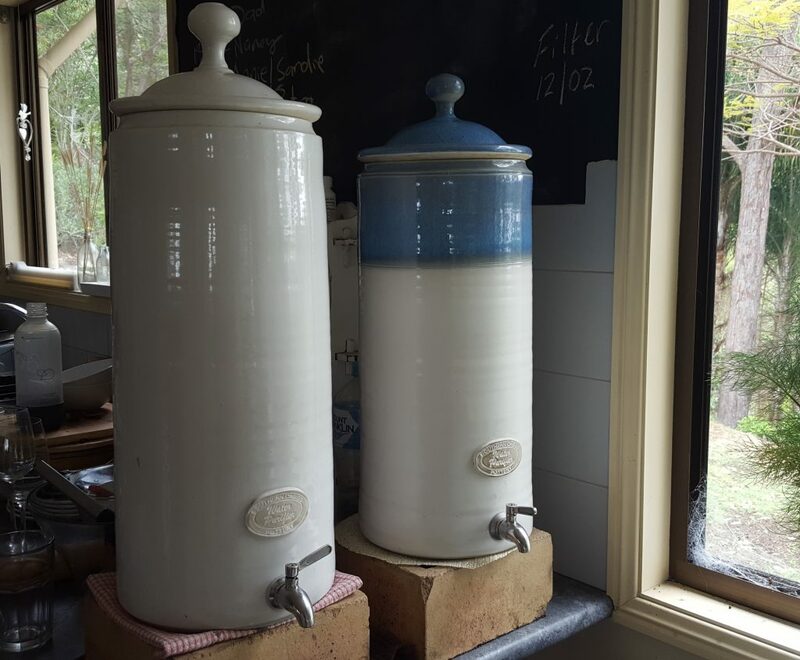 This also means we use the pump less by storing our drinking water in our ceramic water filters. I wouldn’t have thought about these things before living off-grid. They may sound simple, but they have helped me to change the way I do things now that I am living off grid. On a big sunny day, I can do anything, but they are not all big sunny days, and a string of three or four cloudy days limits our power production. Through experience, I have found there are alternatives to power driven devices….